The wow macro system is great for combining several slash commands that execute together when you click a single action button or keybind. It allows for a total of 54 macros (36 account wide and 18 character specific ones). Some people love them (including me!) and others are afraid to use them for fear of being accused of cheating or simply being unaware of how to program them. Devs are looking into revamping the whole macro system at some point, meanwhile, simply increasing the number of slots would probably be good enough. They were having some discussions about doing just that but we still don’t have any concrete plans on the way, if anything changes we’ll let you know. 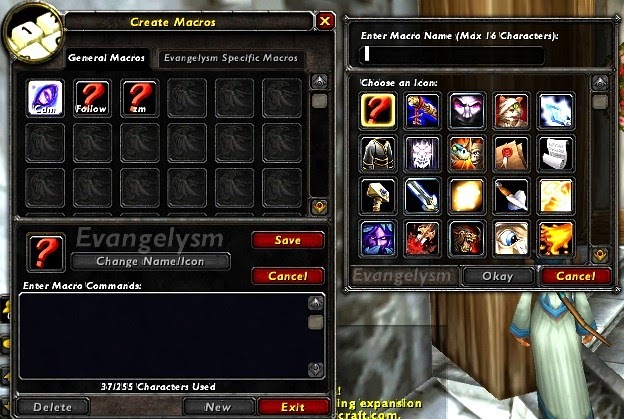 Upon reading this news I was overjoyed as I have all my macro slots full on all my priests and my paladin and then I sat down and thought exactly what I wanted from the changes and to be honest I couldn’t think of much I wanted changed beyond more slots and more character spaces to allow more complex macros. It is not that I want to have an I win macro or a lazy man’s macro that simply has a complete rotation in one massive /castsequence macro, that was so vanilla and if I wanted to spam 1 button I could just go play an arcane mage or a windwalker monk. However, there are some features that while not being a game changer would make the macro system better. The last item on that list needs a bit of explaining as what I’m after is a macro that changes completely depending on your location. If you’re doing the Golden Lotus dailies it could be the bomb for bombing teh cannons, in Nizao Temple it could be for throwing the bomb at the mantid vehicle, in the Heart of Fear it could be the Impaling Spear in Mel’jarak’s room. This is possible as there is an addon, I Has Macro Lol that does exactly that, sadly it is now woefully out of date and being botched to make it work so I simply refuse to use it. Beyond those six things I can’t think of much to add to the system. What would you like to see changed in teh macro system? However, I realise that this was likely introduced to make automated play more difficult to put into addons. Personally I think for those who really want to use macros and understand where and why they are useful there is plenty of information out there. I first discovered macros because of the need to quickly dispell the debuff on Maiden of Virtue in KZ and from there my use of them has grown and shrunk over various xpacs. I try to use them fairly sparingly as I try to stay away from the limit because it can becoming annoying to manage them when you have so many!